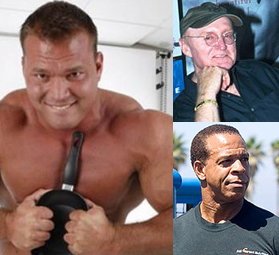 Heavy Muscle Radio (07-13-09): Derek Poundstone, Jon Lindsay, Bill Grant! Home Radio Heavy Muscle Radio Heavy Muscle Radio (07-13-09): Derek Poundstone, Jon Lindsay, Bill Grant! Strongman Derek Poundstone calls in to update us on how he did at FORTISSIMUS (2nd stop on the Triple Crown of Strongman). Bodybuilding legend, Bill Grant, drops by to update us on this year's NPC Bill Grant Classic. Don't miss Bill since we're sure to get a good Arnold story from the old days, as well. NPC USA promoter Jon Lindsay drops by to give us the final contestant count for the July 24th and 25th event. Did the new Bikini division really push the USA numbers to almost 500 strong?